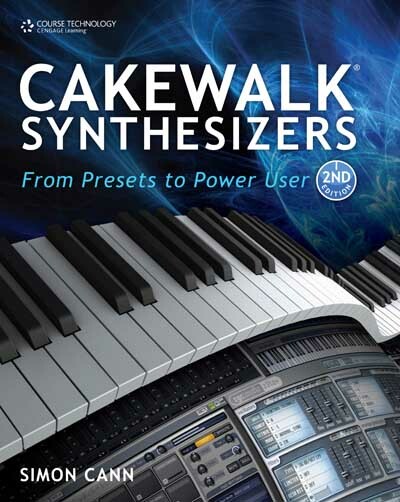 If you’ve come looking for the Cakewalk Synthesizers download package, then you’ve come to the right place. Please click on this link to access the download materials that accompany the second edition of the book. This download package includes the download chapters and the programs described in the book. Full details of the material and of how to load the programs are included in the Read This First note included within the package. Use the materials for your own purposes. Redistribute the package, provided it is kept in its original form. To be clear, you may effect the redistribution by emailing the zip file which contains this package, including the zip file on a CD/DVD, posting the zip file on a website for download, and in any other way you can think of. You may not charge for this material (although it may be part of a commercial package, for instance, a DVD on a magazine’s cover). You can amend any of the sound files within the package, but please then remove any reference to my name and the book before you redistribute any amended file. Do not pass off any amended file as being my work, and do not include your own files (and/or amended files) within a redistributed download package in a manner that implies your files are related to this book. This approach is different to the approach that we (the publisher and I) took with the first edition and I must reiterate that all materials within this package are copyright. The copyrights and the warranties relating to these materials are set out in the book.